This includes persons who are forcibly displaced (notably refugees, asylum-seekers, IDPs), those who have found a durable solution (returnees), as well stateless persons, most of whom have never been forcibly displaced. Globally, there are 34 million people who have been displaced within their own country, known as internally-displaced persons (IDPs), who are protected and assisted by the UNHCR. The largest numbers of IDPs are found in Syria (7.6 million), Colombia (6.5), and Iraq (4.0). 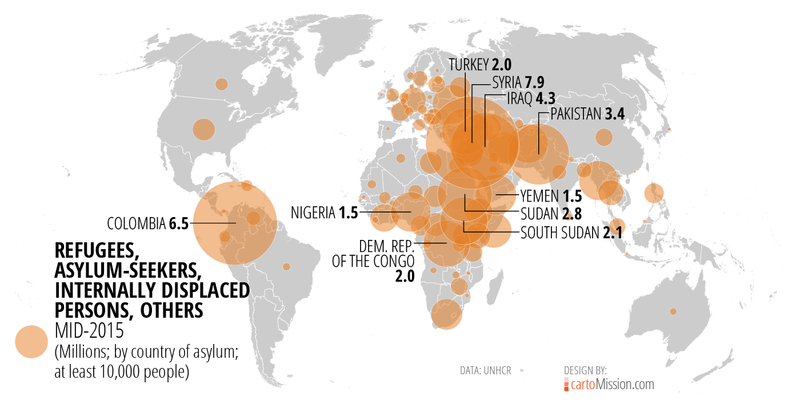 The largest number of refugees under the UNHCR’s mandate, those who have fled their country, are found in Turkey (1.8 million), Pakistan (1.5), and Lebanon (1.2. ).